Remember the last time you experienced a sudden change or overwhelming situation in your life. Was your animal companion there as a comfort to you? A simple lick to the face or snuggle on the couch can mean the world to us when we’re sad, lonely, or under the weather. But what happens when our animals experience pet stress and need a calming presence in their lives? Are we able to recognize the signs and return the favor? Sometimes our pets do things to frustrate us - things like freaking out and barking for seemingly no reason or destroying your things when you’re out during the day. You may have scolded your four-legged family member for whining too much, obsessive licking, or doing their business on your carpet. 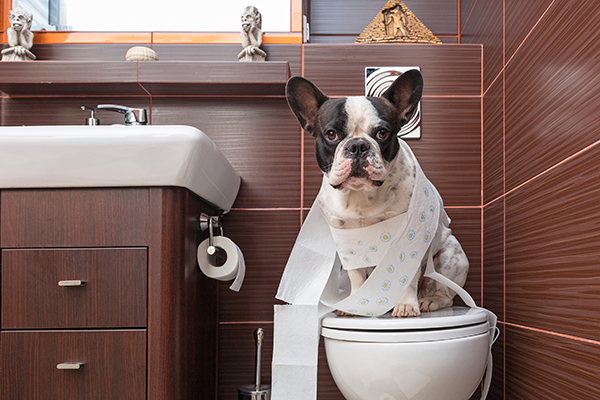 The truth is...sometimes our pets are downright naughty, but there may be more to it than that. If only they could explain to us why these behaviors happen, we might have more compassion on them. After all, our animals don't do things to purposefully upset us. These things often happen as a result of their anxieties and/or inability to figure out how to properly handle it. Fireworks, sirens, thunderstorms, even construction sites – these things are loud! And, well, our pets don’t always do very well with loud. Loud is scary. Loud is intimidating. Loud is frightening. When things are loud, our pets get really worried. They may start running around crazy or barking like mad every time you get the vacuum cleaner out or a door slams. They just want the loud to stop. And when it doesn’t, they don’t know what to do. Being alone can really bother some of our animals. Why? They don’t necessarily know if we're coming back, and our pets can become confused and/or angry as a result. But more than anything, being along can make them nervous and worried. Some may even lose it when you quickly check the mail! One minute we're there and the next minute we're gone. When our pets can’t see or hear us, and the door is closed, they can experience a lot of stress. This explains many a destroyed couch pillow and shredded paper towel roll. As great as many pets are with kids, kids aren't always so great with pets. Especially with toddlers who are still learning to be gentle, pets are often on the receiving end of tail pulls, pokes, and squeezes that are too rough. Children also scream, cry, or make other startling noises that can put our dogs and cats on edge. They may even chase them around the house. If notice your pet running away, hiding under a bed, or growling, this is their way of alerting you that they could use some space. Sometimes there are just too many people, noises, scents, or other animals in our pet's personal space, which can make them very nervous. They may act skittish or run behind you on a leash. Try not to get too frustrated if you get all wrapped up because your pet isn't walking properly. This could make them even more nervous because they can tell you’re disappointed in them. A little reassurance goes a long way in the face of overwhelming crowds. 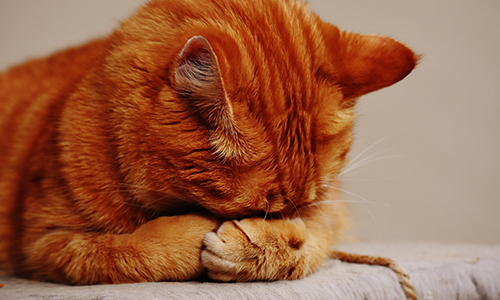 What's the best place to start dealing with pet stress? 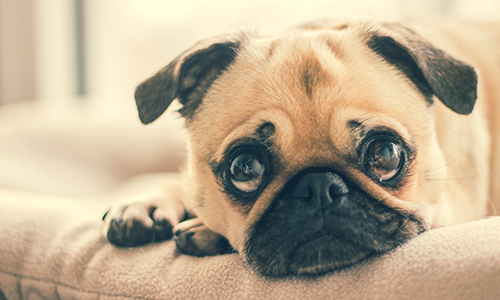 If the symptoms of anxiety are severe, and you're struggling to make changes be sure to make consult your vet to make sure there's nothing physically wrong with them. There are also many ways to help keep your pet's environment calm, such as keeping a fixed, regular schedule. This helps your dog or cat gain confidence in knowing what comes next (like when you come home) each day. You may also want to try leaving a radio or TV on during the day that plays calming music. Something classical, relaxing, or instrumental tend to work best, but some types of music can actually increase pet stress. Be sure to experiment with different music to see your pet's reaction ahead of time. Pressured shirts/wraps and calming sprays can also help your animal, or you could even go so far as to give them a calming massage! Tried Everything, but Still Having Struggles? It's important to consult your veterinarian, so we can explain different types of anti-anxiety medication and all-natural alternatives that are available and safe to use. Delavan Lakes Vet Clinic carries a wide range of products you may want to try. If you have any other questions, or need to schedule a visit, please give us a call at 262.728.8622!